Please refer to our stock # T 1737 when inquiring. For your fave DVM: Masterful MOP carving and detail tube hinge brooch! 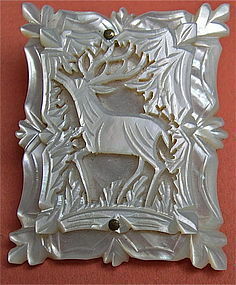 Not often seen Victorian carved reticulated 2 pc riveted layered construction MOP mother of pearl figural rectangle pin brooch of an antlered stag reindeer buck in the forest. 1 5/8" X 1 1/4" X 5mm thick. Flashes of light lavender, pink and aqua. Lots of hands and cameos out there but only this very Victorian stag theme brooch here. Appears to have had safety added later as many treasured 19th century pins demonstrate; semi tube brass hinge and rivets. $10 USPS Priority/Ins/Track or FREE with your USA Ck or USPS MO.